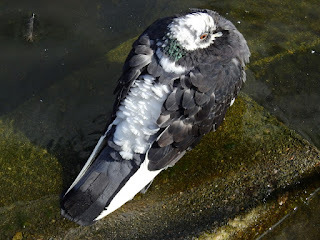 The pigeon-eating Lesser Black-Backed Gull ate his latest kill alone on the Serpentine. 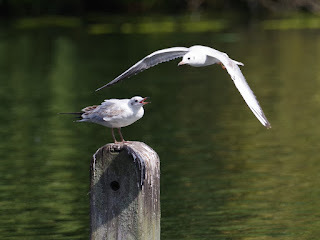 The young gull that approached him seemed to be his offspring, and begged to be fed but it didn't get anything -- once out of the nest, the young are expected to fend for themselves. 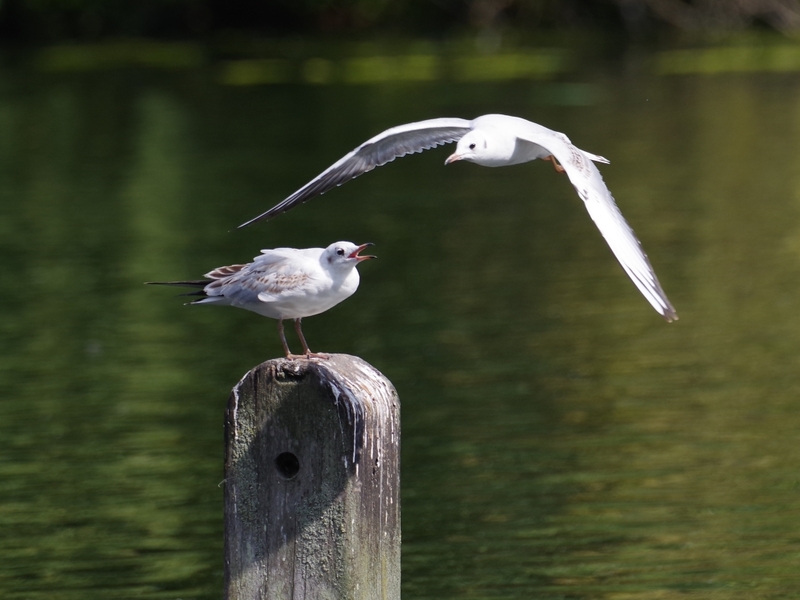 Another young gull arrived and got the same treatment. ... and others failed. Probably this reflects the gulls' social hierarchy. 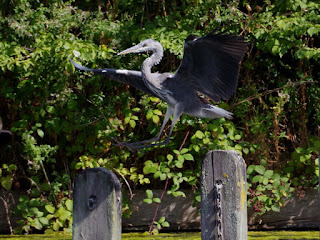 One of the young Grey Herons from the island arrived and landed perfectly on a post. It has got its flying skills finely polished in a very short time. 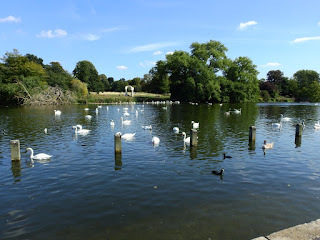 There were a lot of Mute Swans on the Long Water. 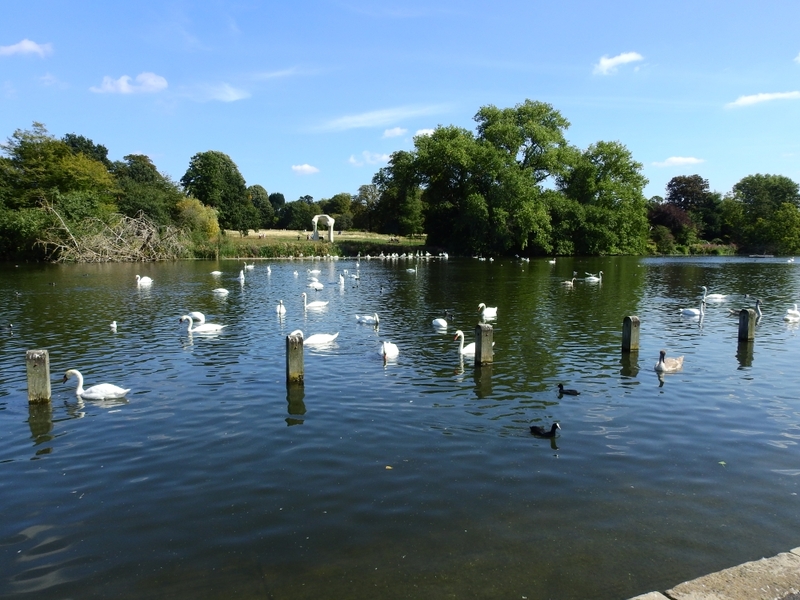 Evidently they had been driven off the Serpentine by some disturbance. In Hyde Park the enclosure for the 'Proms in the Park' has now been put up, and the sound engineers were playing dreary pop music at deafening volume, so I felt like leaving too. The dominant swan will have his work cut out rounding them up and chasing them back under the bridge. 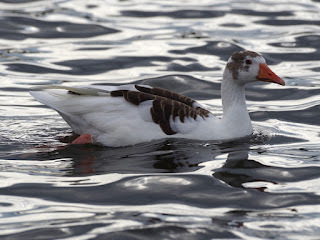 The grey and white goose that I supposed was a domestic--Greylag cross was on the Round Pond. 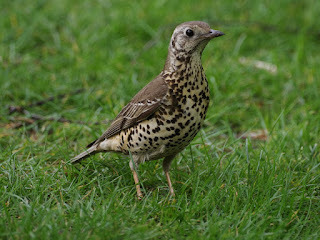 I met Jon Ferguson there, and he told me that in fact this bird is of a domestic breed. It's a West of England Goose. 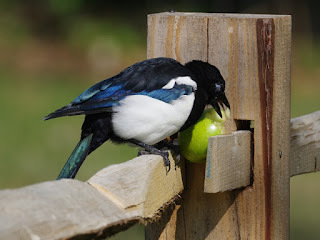 Females have grey patches, males are almost pure white. A Grey Wagtail hunted insects around the Dell restaurant, refusing to stop to have its picture taken. But later I managed to catch it, paused for a few seconds on a rock beside the pool at the top of the waterfall. 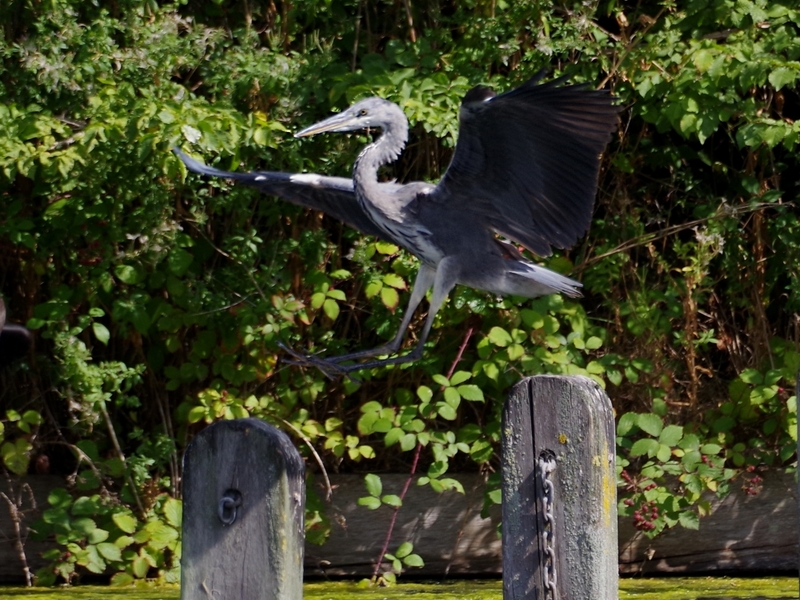 Two Cormorants dried their wings on the posts next to the bridge. The Coot family from the nest in the reed bed ranged along the edge of the Serpentine. The chicks were begging to be fed, but they are now also finding food for themselves. 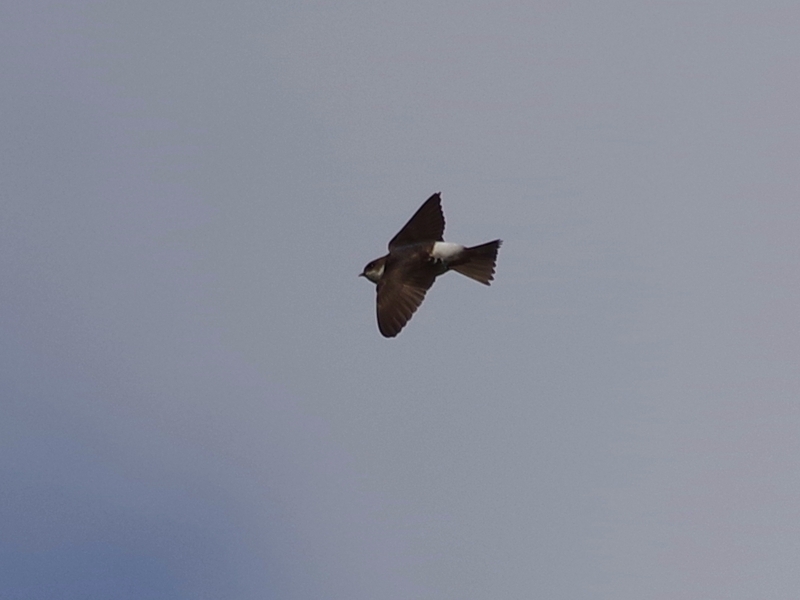 ... and three very late House Martins flew over, heading south. 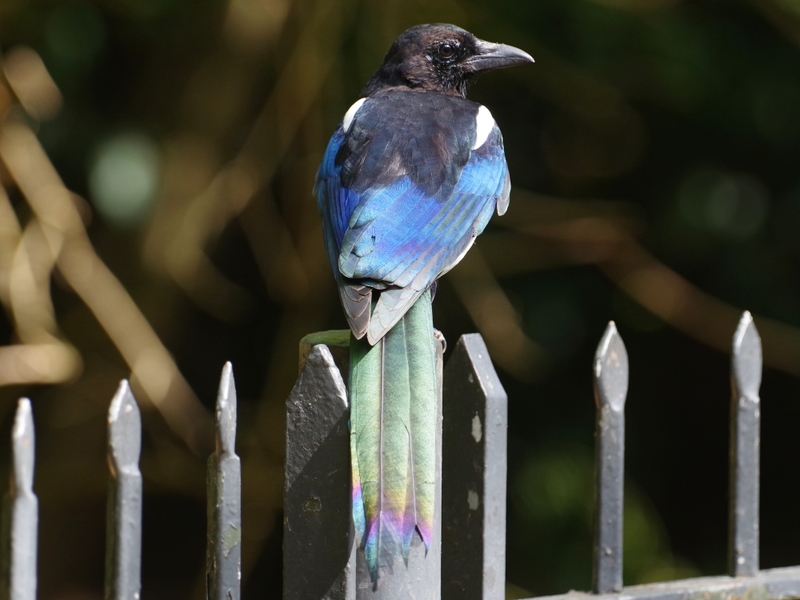 At the leaf yard, a Magpie ate an apple put on the wooden fence by the people who feed the Rose-Ringed Parakeets. Another looked very shiny on the railings. A black and white Feral Pigeon ruffled up its feathers on the edge of the water at Peter Pan. 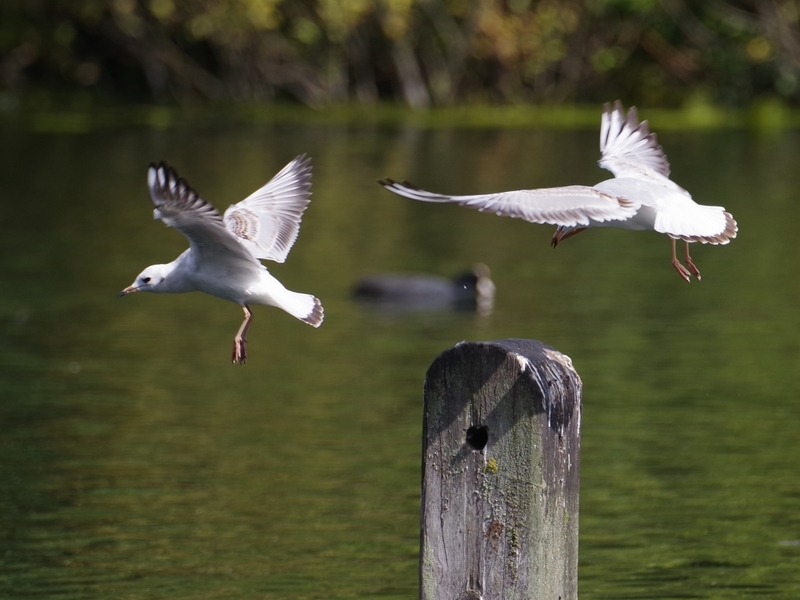 Haven't seen that gull for some time, so I think it must have moved somewhere else. It used to be regularly on the shore near the Triangle car park. Suppose the concert is called 'Proms' because it coincides with the Last Night of the Proms at the Albert Hall. But, as you point out, it isn't logical. You may not have taken a picture of the woodpeckers, but from my point of view the lovely Mistle Thrush and the shiny magpie more than make up for it. 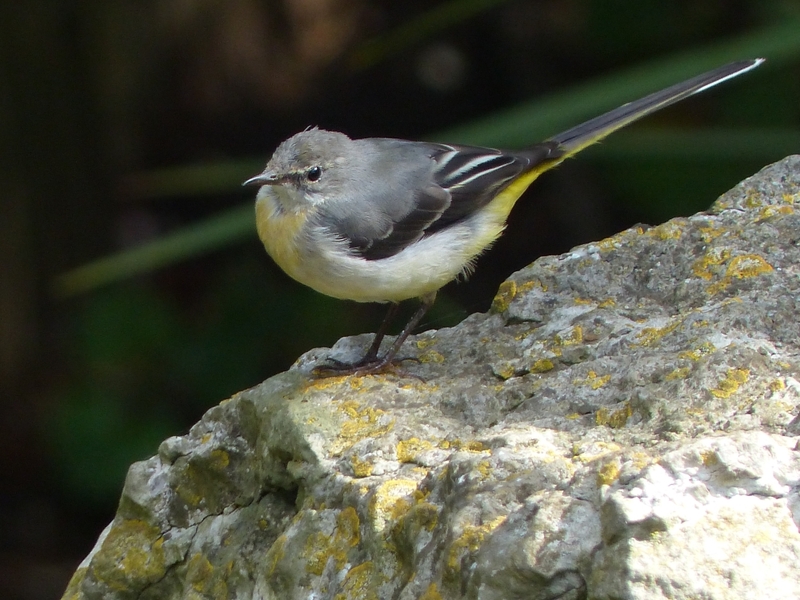 Congratulations on being able to take a picture of the eternally-on the move Grey Wagtail, by the way. The begging cries of young Gulls are so disturbing. I guess it is a case of cognitive disonance. They sound so helpless, pitiful, and small - and yet they are perfectly able to kill anything smaller than themselves. The pathetic little squeaks made by huge brutal teenage Mute Swan cygnets seem even more incongruous.